This was contributed by Dr. Johanna Moore, one of my Hennepin Colleagues who researches CPR, along with Keith Lurie and Demetris Yannopoulos. She translated her research knowledge into a spectacular resuscitation. A 54 year old male presented via ambulance to the Emergency Department (ED) in cardiac arrest. 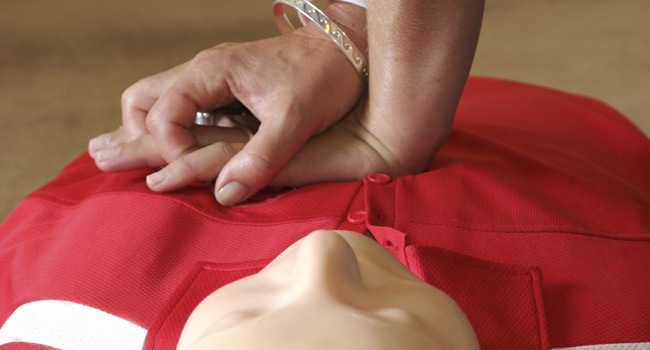 He was found down outside a clinic, where bystander CPR was initiated by clinic staff. The amount of down time was unclear but thought to be minimal as this was a high traffic pedestrian area. He received an estimated 5 minutes of manual CPR, then, after medic arrival, 20 minutes of LUCAS CPR, including use of theinspiratory threshold device (ITD, ResQPod) pre-hospital. He was noted to be in refractory ventricular fibrillation by paramedics. As part of his pre-hospital care, a King airway was placed, he was defibrillated 7 times, and received 300 mg IV amiodarone, followed by 150 mg IV amiodarone. He also received 2 mg epinephrine. He was noted to be “chewing” on the King airway and was also given 2 mg IV versed for this. On arrival to the ED (after 25 minutes of pre-hospital CPR), the patient had agonal respirations and had brief movements of his upper and lower extremities while on LUCAS. [The presence of gasping, or agonal, respirations during cardiac arrest is associated with improved survival1,2.] His continuous end tidal CO2 readings throughout the case averaged in the 30s mmHg (a sign of effective CPR and good outcome). LUCAS CPR, with ITD use, was continued. The King airway was exchanged for an endotracheal tube without interruption of CPR, and blood was noted to be pooling in the posterior oropharynx at that time. Blood in scant amounts was also noted to be coming out of the endotracheal tube intermittently. The source of the blood was unclear. He was noted to be hypoxic at that time, with initial recorded oxygen saturation of 70%, and a nadir of 49%. Post intubation, the oxygen saturation remained low, in the 70-80% range. Several rounds of ACLS medications including epinephrine, sodium bicarbonate, and calcium gluconate were given along with further defibrillation attempts. The rhythm would intermittently convert to ventricular tachycardia after defibrillation but would rapidly degenerate into fibrillation. This is fascinating: The septum is fibrillating, but the lateral wall (lower right) is not. As you will see later, this is because the lateral wall is where the STEMI is. It is too ischemic to even fibrillate! At around 15-20 minutes into the case, the head of the bed was elevated as much as the LUCAS would allow (10-20 degrees) in an attempt to improve oxygenation and preserve neurologic function (“Head Up” CPR3,4). The patient remained in refractory VF.Lidocaine 100 mg IV was given, as well as 2 g of magnesium empirically. 20 mEq KCL was given after the initial potassium returned at 2.6 mEq/L. The patient remained in refractory VF and an esmolol bolus, then drip, was started for treatment of ventricular storm.5Further defibrillation shocks were administered without ROSC. Movement of the patient during CPR had stopped, but the end tidal CO2 remained over 20 mmHg. His oxygenation saturation had improved after intubation and placement in the Head Up position. Double defibrillation6,7 was then performed by placing two separate sets of pads on the patient at once, then performing a simultaneous shock. After 38 minutes of ED CPR and 25 minutes of out of hospital CPR (total, 63 minutes), ROSC was obtained, with a corresponding increase in end tidal CO2 from the 30 mmHg range to 50 mmHg range. The patient was kept in the Head Up position. His Chest X-Ray showed diffuse right lung airspace opacities.